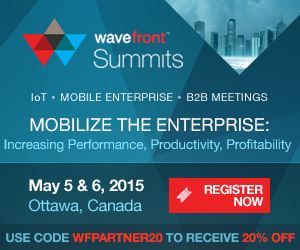 The 4th annual Wavefront Summits will focus on the business implications of IoT and Mobile Enterprise and their convergence. Learn about the speed, magnitude and degree of change that is occurring, and how all-encompassing this change really is. Hear how industry thought leaders are embracing this transformation, adopting novel wireless technologies, and gaining global competitive advantage. Jeff Seifert, Chief Technology Officer, Cisco Canada: Jeff provides technical guidance and direction in key advanced and emerging technologies and go-to-market strategies. His work with many governments, enterprise, and service provider customers in Canada and globally is influencing how Cisco brings products to market. Terry Dell, Innovation Specialist, Verizon Wireless: Terry identifies opportunities in the market to leverage emerging technologies to develop solutions for the puzzling challenges faced by companies and customers. He draws upon a blend of business and technical experience to identify and deliver the right solution. Use the WFPARTNER20 code at checkout to get 20% off the regular conference price, iving you a preferred guest rate of $399.20.